We share a deep love of the string quartet repertoire and a desire to communicate this to our audiences. Violins Peter Bussereau & Marcus Broome, Viola Ania Ullmann, Cello Julia Graham. 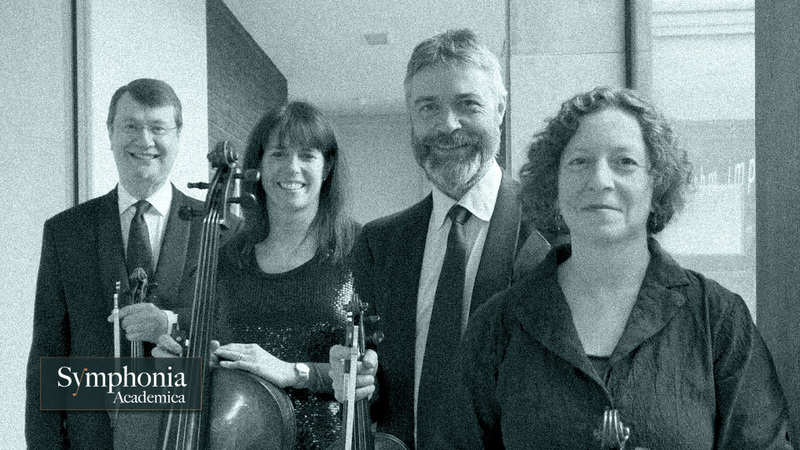 Our string quartet was created by the principal players of Symphonia Academica to perform the varied and exciting repertoire of music written for strings. The quartet's ability to draw the audience into their sound world comes from the exacting levels of musicianship required to perform and interpret this inspiring area of chamber music. They perform with passion and commitment works that are the artistic aspiration for these dedicated musicians. With the addition of guest pianists and wind players the quartet can offer wide ranging and attractive programmes of music ideally suited for the concert hall or more intimate performance spaces. The quartet is also very experienced in creating education projects working with students from school to university level, creating composers workshops and working with adults from various creative areas. With a repertoire that encompasses the music of Bach, Haydn, Mozart and Beethoven to more contemporary works by Osvaldo Golijov, Avro Part, Einojuhani Rautavaara and Alex Woolf please contact us for more details of suggested programmes.